A guardrail is, first and foremost, a safety barrier intended to shield a motorist who has left the roadway. The best case scenario, if a car is careening off the road, would be for that car to come to rest unhindered. In some cases and places, however, that is not possible. The roadway may be abutted by steep embankments or side slopes, or it may be lined with trees, bridge piers, retaining walls, or utility poles. Sometimes it is not feasible to remove those things. In those cases – when the consequences of striking a guardrail would be less severe than striking the other objects next to the roadway – guardrails should be installed. They can make roads safer and lessen the severity of crashes. The guardrail can operate to deflect a vehicle back to the roadway, slow the vehicle down to a complete stop, or, in certain circumstances, slow the vehicle down and then let it proceed past the guardrail. This is not to say that guardrails can completely protect against the countless situations drivers may find themselves in. The size and speed of the vehicle can affect guardrail performance. So can the vehicle's orientation when it strikes the guardrail. There are many other factors. Transportation engineers, however, carefully weigh the placement of guardrails so that for most drivers in most conditions the barriers work – and work well. Guardrails function as a system, which includes the guardrail itself, the posts, the soil that the posts are driven in, the connection of the guardrail to the posts, the end terminal, and the anchoring system at the end terminal. All these elements have a bearing in how the guardrail will function upon impact. 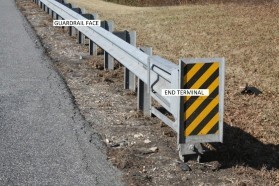 To simplify, a guardrail consists of two key functional components: the end terminal and the guardrail face. The Guardrail Face. 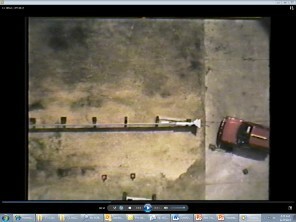 The face is the length of the guardrail extending from the end terminal alongside the road. 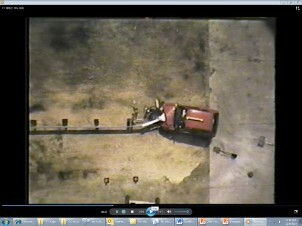 Its function is always to redirect the vehicle back onto the roadway. The End Terminal. The starting point of the guardrail is referred to as the end treatment. The exposed end of the guardrail needs to be treated. One common treatment is an energy-absorbing end treatment that is designed to absorb the energy of an impact by having the impact head slide down the length of the guardrail. These end terminals function in two ways. When hit head-on, the impact head slides down the guardrail flattening, or extruding, the guardrail and redirecting the guardrail away from the vehicle until the vehicle's impact energy is dissipated and the vehicle has decelerated to a stop. 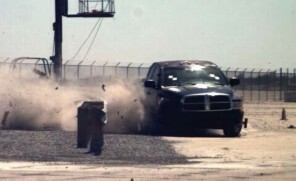 When hit at an angle, the impact head may partially extrude the guardrail and then "gate" out of the way allowing the vehicle to pass behind the guardrail. This means the terminal and guardrail is pushed through, as if opening a gate. 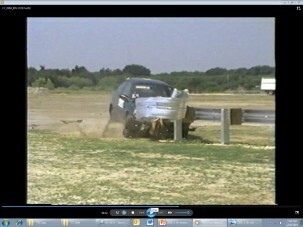 Guardrail system performance is assessed through crash tests in a controlled environment. 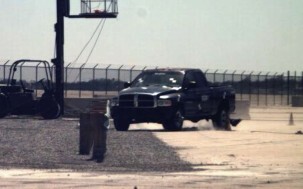 The crash tests are determined by roadway safety professionals and spelled out in crash test criteria. 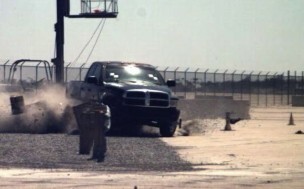 A barrier is "crashworthy" if it meets the crash test criteria in effect at the time of the testing and established for that type of roadway safety device. Crash tests for guardrail systems essentially test the two components noted above â€“ the guardrail face and the end treatment. 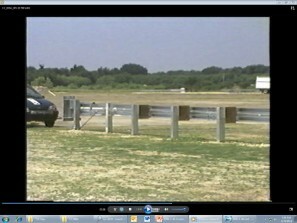 The guardrail face tests determine whether or not the vehicle is redirected back onto the roadway. 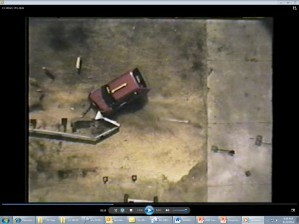 Shown below are three still shots of a pickup truck striking a guardrail face and being redirected. The end treatment tests are conducted with the vehicle striking the end treatment head-on, striking the end treatment at an angle, and striking the guardrail just downstream from the end treatment. 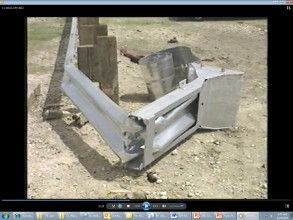 The still shots shown below are those of a gating, energy-absorbing guardrail system. The ET-Plus is an example of this type of system. 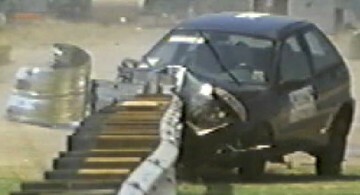 For head-on impacts, an energy-absorbing guardrail end terminal should absorb the energy of the impact, and extrude the guardrail away from the vehicle as shown below. For angled impacts on the "nose" of the end terminal, a gating guardrail system will bend and 'gate' out of the way allowing the impacting vehicle to slow down and pass behind the guardrail. Depending on the angle and location of impact, the guardrail may partially extrude prior to gating. Because these crashworthiness tests are conducted with vehicles traveling at a speed of 100 kilometers per hour (62 miles per hour), if a vehicle hits a guardrail at a higher speed, the guardrail may not operate optimally.